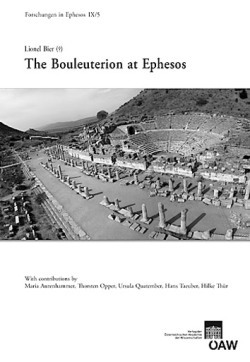 This volume aims to present a comprehensive publication of the Roman Bouleuterion (town hall) at the Greco-Roman site of Ephesos (Turkey) including its decoration. It is based on a manuscript by the late L. Bier concerning the history of research and the architecture of the monument, with contributions by H. Thür (architecture), U. Quatember (architectural decoration), H. Taeuber (inscriptions), M. Aurenhammer and T. Opper (sculpture). Bouleuteria of the high Imperial period were multifunctional buildings, offering space for civic administration but also for cultural performances. The Bouleuterion at Ephesos comprised a semicircular auditorium oriented towards a two-storeyed scene. L. Bier discerned two main construction phasses and presented a reconstruction of the scene. The scene wall of about 100 A.D. was structured by a series of single columns. In the main phase of the 150s A.D., P. Vedius Antonius, the city´s eminent benefactor, dedicated the conversion into a modern aediculated facade and its sculptural decoration. The sculptural program (a portrait gallery of the Antonine dynasty) and the inscriptions attached to the scene wall ("Imperial Letters") illustrated the close relationship of sponsor and emperor. The portrait statues (only fragmentarily preserved) were set up in the reign of Antonius Pius but obviously not all of them at the same time. The portrait of a girl might represent one of Marcus Aurelius´s daughters. The architectural decoration of the main phase of the building was also part of the carefully designed program. The Bouleuterion was used as a building until Late Antiquity and beyond.